The Marsa racetrack hosted the first meeting for the 2016 season, yesterday afternoon. 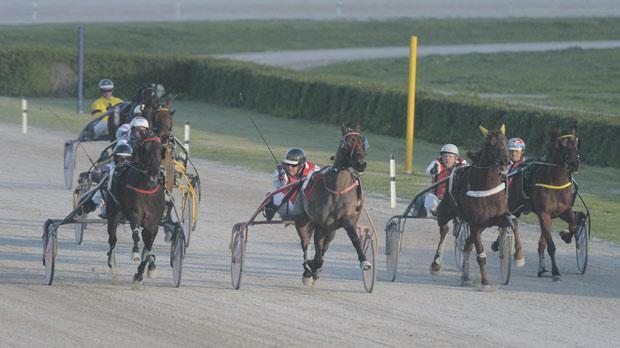 The programme consisted of nine races, all for trotters, on a short distance of 2,140m. The most important race of the day was open for class Premier trotters with victory going to Sweden’s Donald Duck Tooma, under the guidance of Caillin Borg. Sixteen trotters lined up for the class Premier race. It was Zwack (Eric Bezzina) that set the early pace, building a half-length lead from Ricardo Mols (Philip Calleja) and Quad Censerie (Charles Farrugia). However with 300m to go Zwack was unable to keep up the pace and in the final straight this Swedish trotter was leapfrogged by Donald Duck Tooma (Caillin Borg), which notched its first win of the year just ahead of Ourasi Diams (Anthony Fenech) and Ricardo Mols. Quito De Neret (Mario Seguna) completed the top four positions. The winner clocked an average time of 1.15.9” per kilometre. The other races in yesterday’s card were open for class Gold, Silver and Bronze trotters. In the first class Gold race, early leader Nevaio Des Bordes (Shaun Portelli) ran out of steam and started to slow down midway through the final straight. The French veteran was overtaken by newcomer Magic Broline (Clint Vassallo) which secured its first win of the season from another debutante, French Seabiscuit Noir (Rodney Gatt). Royal Apanage (Redent Magro), another new horse in Maltese racing, finished fourth. Italian Nashville Dancer (Andrew Farrugia) produced a strong dash from the outside 300m from the end of the second class Gold race. This Italian nine-year-old took the lead midway through the final straight and gained its second win in a row by half length from Mission Di Poggio (Charles Camilleri) and Time Square (Michael Ellul). Phenix De La Roque (Noel Baldacchino) was fourth. During yesterday’s meeting a number of presentations were held, involving the major winners of last season. Noel Baldacchino was awarded the best driver of the year and Redent Magro finished the best U-25 driver. A commemorative plaque was also presented to the owners of the trotter Royal In which finished as the most consistent trotter last year. These presentations were carried out by Edwin Borg, Malta Racing Club chairman, and official George Farrugia. Another meeting at Marsa will be held on Sunday. The first race should start at 1.30pm.